Durango Silver Company specializes in cutting and making jewelry with the finest Turquoise & Gemstones we can obtain. We can not garauntee all rough to be consistent, unless you are buying stabilized Cananea or Sleeping Beauty and even that is not all the same. All sales are final & We prefer to send samples to first time buyers. Mint Green, Brown, Dark Mint Green, White available. Try some of our rock, it's garaunteed the real thing, we dug it ourselves!! This is some hard to get material. This material is mint green or Olive Green, with Black spiderweb matrix. Awesome spiderweb! The material is so hard it is nearly like cutting agate! The polish this stuff takes is like glass, just awesome! I can not keep the jewelry I have made up with this material in my store or my travel cases! This material is between a 7-8 on the mohs scale! Royston is an old Nevada Mine that produces a beautiful medium blue to dark green turquoise with brown matrix. You will often get a stone that is blue to green fade as well as emeral green stones. This is vien and seam material. It is a treat to cut as most all of the stones are winners! You will love this material. Note: you will need to saw the host rock away from the Turquoise as it is vein material. This is what makes this Turquoise so rich in color and matrix. Lizardite is one of the markets newest stones. It is a gorgeous canary yellow stone that often has a Magnetite or Lodestone as a matrix that forms a beautiful black spiderweb pattern. It has been sold in recent years to the retail customer as "Yellow Turquoise". This stuff comes from a small mine in Tibet. It is about a 5 on the mohs scale. You will get yellows, reds, greens with black or brown matrix. Great material for cabbing or carving. Once you try this in your jewelry or carvings you will be hooked. In our retail store in Durango we can't hardly keep this stuff in stock! This Material is Mostly Green!. The Blue Creek Turquoise Mine is located in the Candelaria Hills mining region of Nevada. 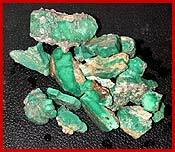 This mine produces a beautiful blue-green and green turquoise and varascite combo. 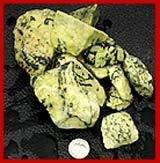 The highgrade is a green with gold or white spiderweb Variquoise in large vein and/or nuggets. Most of this material is a deep green, light blue, and a dark green and light blue mix. There is not much spiderweb material, please do not expect us to send you all spiderweb material, nobody can garauntee that. This material is gorgeous! It is hard material and is nice for cabing or inlay. Some of our favorite material. The White Creek Mine Produces a beautiful white turquoise, and yes it is actually turquoise, not mangesite. Alot of this material has a slight blue tint to it, and it looks alot like Dry Creek turquoise. The other look of this material is very similar to the White Buffalo Mangesite look. Good stuff, cuts nicely. This material is blacks, browns, reds, and whites. Awesome stuff! Makes great pictures and almost scenic cabochons. Most of this material came from the fourcorners region, from approximately 225 million years ago in the late Triassic. This material is bright red with swirling yellows and clear sections. lots of beautiful stones out of each boulder. Rocks as large as 1 foot in diameter. Very hard and nice to cut, takes a fantastic shine. WE SELL THIS MATERIAL ON A DAILY BASES AND IT IS WHAT WE SAY IT IS BEYOND A SHADOW OF DOUBT. WE DO NOT LIE AND HAVE NO NEED TO WE PREFER TO HAVE A GOOD REPUTATION. PLEASE ASK EVERYTHING YOU CAN BEFORE YOU BUY.